Engr. Filemon A. Abad,(in orange polo shirt in front) delivers a re-echo on their three days seminar on Document Tracking System (DoTS) for Civil Works Project on July 4-6, 2018. The re-echo was conducted at BDEO Conference hall on July 19, 2018 participated by some 50 BDEO Personnel. NAVAL, Biliran – To better understand the electronic routing slip system of the Department of Public Works and Highways (DPWH), Biliran District Engineering Office (BDEO) takes initiative to hold a re-echo on the seminar on Document Tracking System (DoTS) for Civil Works Project on July 19, 2018 at BDEO Conference hall. 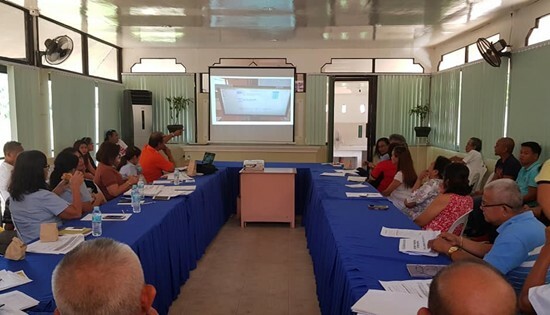 The DoTS for Civil Works was carried out in a three days seminar at the DPWH Regional Office, Baras, Palo, Leyte on July 4-6, 2018 and was compressed into a three-hour discussion at Biliran DEO to give insights to some 50 Biliran DEO employees who are directly or indirectly involved in documents processing. DoTS is an electronic and dynamic routing slip develop to monitor the status of documents in the department. It tracks down slow moving documents and pinpoints those responsible for the delay in the processing. This is in line with Department’s thrust to fast track the completion of projects and to be transparent in its operations. Under the leadership of District Engineer David P. Adongay Jr., BDEO will soon be using this system as per DPWH Department Order (D.O.) 142 series of 2017 as it is now being implemented in the DPWH Regional Office VIII as well as in the Central Office. According to Luisito Filemon A. Abad, BDEO Procurement Unit Head who gave the talk on the DoTS re-echo, the said system has already started in 2012 in the Regional Office but was discontinued after the onslaught of Super Typhoon “Yolanda” (international name Haiyan) in 2013. Presently this is now in operation. To properly implement the said system in the district, BDEO appointed DoTS officers who has took the recent training on DoTS to smoothly manage incoming and outgoing communications through the said tracking system. DO 142 series of 2017 re: Implementation of the Document Tracking System (DoTS) for Civil Works Projects covers documents on As-Built Plans, Detailed Engineering Design Plans, Program of Work (POW), Approved Budget Contract (ABC), Award and Signing of Contract, IROW payment and other civil works related documents. 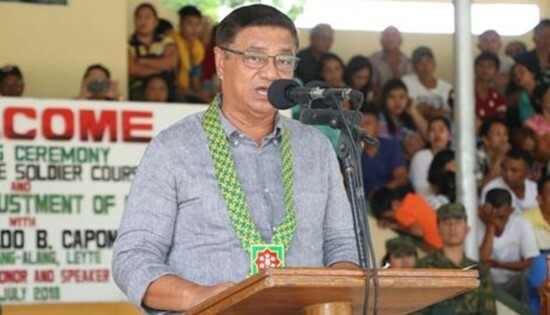 Alang-alang, Leyte municipal mayor Reynaldo B. Capon Sr. cites his experiences and lessons learned being a former soldier as the Guest of Honor and Speaker during the closing ceremony of the Philippine Army Candidate Soldier Course Class 538-18 on July 24 in Camp Lukban, Catbalogan City. CAMP LUKBAN, Catbalogan City – The Philippine Army Candidate Soldier Course Class 538-18 composed of two hundred forty eight (248) able-bodied Filipinos was formally closed today, July 24, 2018 at 10:30 A.M. at the 8ID Grandstand, Camp Lukban, Barangay Maulong, Catbalogan City, Samar. The closing ceremony was graced by a former soldier himself, Hon. Reynaldo B. Capon, Sr., Municipal Mayor, Alang-Alang, Leyte, as the Guest of Honor and Speaker who further led the ceremonial entrustment of firearms, distribution of certificates, and individual achievements. The entrustment of firearms to the 248 newly enlisted privates symbolizes their acceptance of responsibilities and commitment to the people and country. Hon. Capon during his inspirational message reminded the soldiers to love their job with utmost dedication, nurture a harmonious relationship with comrades and the people in the community wherever they may be assigned. He also reminded them to avoid getting involved in any misconduct that will tarnish their image. Morever, Maj. Gen. Farnacio congratulated and thanked the families, relatives, and friends of the newly enlisted privates for their support and trust to 8ID. MAKATI CITY – The Department of Trade and Industry, as the temporary secretariat of Anti-Red Tape Authority (ARTA) is now focusing on streamlining government procedures for business registration by developing an end-to-end business registration and unified application form, heeding the President’s directive to implement Republic Act 11032, also known as the Ease of Doing Business and Efficient Government Service Delivery Act of 2018. The President, during his SONA directed all local government units and national government agencies to faithfully implement this law and simplify government process. “I particularly call the attention of the agencies with the [most] number of red tape-related reports from the public, make your services truly customer-friendly. Our people deserve efficient, effective, and responsive government services. They deserve nothing less.” said the President. DTI Secretary Ramon Lopez, who concurrently chairs the Ease of Doing Business and Anti-Red Tape Advisory Council (EODB-ARTAC) pointed to burdensome business registration process, which is a subject of frequent complaints by the public. “It takes 16 steps and 28 days to start a business in the country, compared to three steps and 2.5 days in Singapore according to the World Bank Doing Business Report. In Singapore, because of online procedure, an applicant will be able to register, do a company search, incorporate and register with the inland revenue authority, in less than one day. We need to improve and be the number one”, the DTI Secretary said. According to Secretary Lopez, this is the reason Anti Red Tape Authority (ARTA) is now implementing Project One: One Form, One Number, One Portal. This aims to develop innovative systems that will drastically streamline business registration process and will provide a pleasant business customer experience that is easy, not confusing nor cumbersome. Project One promotes bureaucratic singularity through whole of government approach and addresses governance concern on data sharing, data accuracy, access to data, and privacy issues. Secretary Lopez also mentioned that one of the three outputs of Project One is an application for an end-to-end business registration that allows business owners to complete their registration using a unified form using mobile application. “We will see in the near future that one can register their business online – using mobile phone. All the entrepreneur need to do is fill up one form upload the requirements and let technology do the rest. We want to do away with the several forms an applicant need to accomplish. You need to concentrate more on your business than get stressed by your business permit” told Secretary Lopez. - Enhance transparency and improve orientation on administrative procedures. - Develop effective coordination among government agencies in the business start-up process including one-stop-shop agencies/ single agency. - Promote simplification, rationalization of business registration and upgrading of national company registers. The DTI Secretary stated that the micro, small, and medium enterprises (MSMEs) will greatly benefit from end-to-end business registration. “The President reiterated the crucial role of the MSMEs in economic development. We understand MSMEs bear the negative impact of bureaucratic red tape. The end-to-end business registration is geared towards supporting our MSMEs, making it convenient for them to start a business,” told Secretary Lopez. The end-to-end business registration will be developed using Design Sprint to be facilitated by Creative HQ of New Zealand. Design Sprint is a 5-day highly-innovative problem solving process, developed by Google Ventures, that engage experts from the government, business, and information and communication technology (ICT) to come up with solution prototype. David P. Adongay Jr.(center), District Engineer of Biliran District Engineering Office receives last July 4,2018 the plaque of recognition for being 2nd place in the active implementation of the DPWH Development Communication Program in Eastern Visayas for the year 2017. 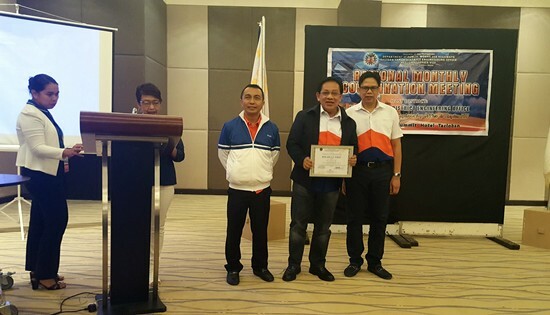 NAVAL, Biliran – The Department of Public Works and Highways (DPWH)- Biliran District Engineering Office (DEO) was awarded Second (2nd) Place in the active implementation of the DPWH Development Communication Program in Eastern Visayas for the year 2017. Under the leadership of David P. Adongay Jr., District Engineer, Biliran DEO has been consistently one of the top five achieving districts in Region VIII since 2012 when it comes to Development Communication Program of the DPWH. The award thru the plaque of recognition was bestowed to District Engineer Adongay Jr. on July 4, 2018 by DPWH-8 Regional Director Edgar B. Tabacon and Assistant Regional Director Eric A. Ayapana during the regional coordination meeting held at Summit Hotel Tacloban, Marasbaras, Tacloban City. On July 5, 2018, Adongay presented the award to Biliran DEO Information Officers Engr. Rosario B. Rosete, PIO Designate together with her P.I.O.-Alternates Engr. Gene F. Delfin, Mrs. Chelsea Quijano-Salloman, Engr. Frechbee L. Sabili, Mr. Penny Lloyd Batoto and Mr. Carl Mark D. Pedrera at the Office of the District Engineer, Naval, Biliran. Adongay said that the award was the result of hardwork and cooperation of everyone and that he is only an instrument in achieving this. Among the 13 District Engineering Offices in Eastern Visayas,, the award was given to the top 5 performers. Included in the top five are Samar 1st DEO (1st place), Biliran DEO (2nd place), Southern Leyte DEO (3rd place), Leyte 4th DEO (4th place) and Leyte 2nd DEO and Northern Samar 2nd DEO both in 5th places. The Communication Development Program of the Department involves information dissemination to the public about the agency’s jobs, programs, activities and its projects which aims to deliver transparency to the public. 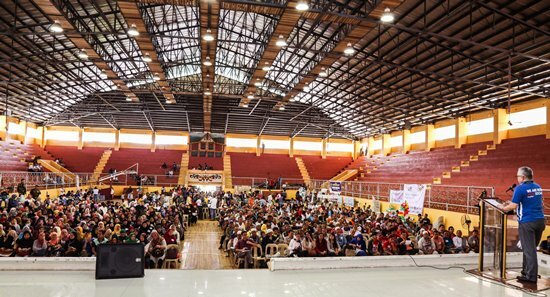 QUEZON CITY – The socialist labor group Bukluran ng Manggagawang Pilipino (BMP) expressed trepidation as former president Gloria Arroyo wrested control over the leadership of the House of Representatives. It was also during her watch when the army and the police open fired at striking workers of Hacienda Luisita in 2004, prompting the BMP to siege the DOLE offices in Intramuros. “Even if Duterte allowed Alvarez to sit beside him at his third SONA, the sullen face of the former speaker throughout his speech reveals that the proverbial axe had fallen even before the joint session was convened,” Espiritu alleges. He noted that during her nine year term as president, Arroyo attempted to change the charter. In her 2005 SONA, she declared to “start the great debate on Charter Change” although her plans were waylaid by the infamous ‘Hello Garci’ scandal and again 2008. “We expect nothing but further circumvention of our rights through the institutionalization of trilateral contracting work arrangements. More misery awaits working class families,” he said. CAMP LUKBAN, Catbalogan City – A team from Bravo Company of 87th Infantry (Hinirang) Battalion while conducting security patrol in the hinterlands of Eastern Samar encountered more or less ten CPP-NPA Terrorists (CNTs) along Brgy. Pinanag-an, Borongan, Eastern Samar at around 11:23 A.M. July 23, 2018. Troops were checking on information relayed by the populace on the extortion activities of the armed group when the encounter ensued lasted for about 15 minutes that resulted in the recovery of one M16 Elisco rifle SN: RP101724. 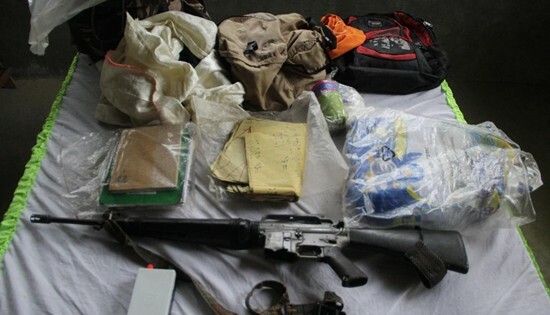 Also recovered were five civilian backpacks containing documents used for CNTs Ideological Political Organizational (IPO) works, and one detonating cord. Wounded was PFC Eric L. Alegria who was hit on his right shoulder while there were undetermined casualties on the enemy side. Maj. Gen. Raul M. Farnacio, Commander 8ID commended the troops for their utmost dedication in performing their mandated duty and urged them to be aggressive against the CNTs who continue to harass civilian communities. CALBAYOG CITY – The Department of Public Works and Highways Samar First District Engineering Office launches an online job matching service for those job seekers and skilled workers who want to work in the infrastructure projects under Pres. Duterte’s Build Build Build (BBB) program. The current administration puts great emphasis in infrastructure development projects which are aimed to increase the productive capacity of the economy and strengthen the investment climate towards inclusive growth. Through the launching of this jobs portal, potential employees are introduced to countless job opportunities. 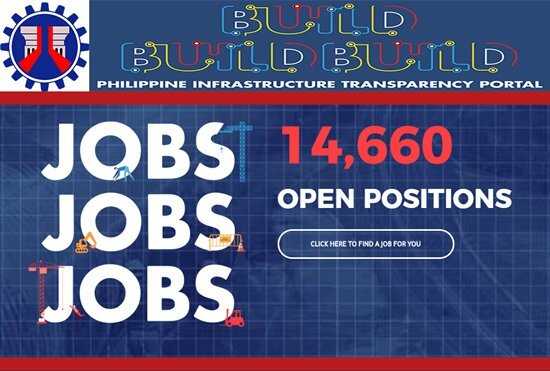 Construction firms with projects under DPWH can post job positions available with corresponding qualifications for a specific project in the Recruitday, an online job matching service. The same goes for DPWH regional and district offices nationwide who are in need of technical and support personnel. The job matching option will provide a more streamlined process of recruitment, making it easier and more convenient to both job seekers and job providers. DAR Assistant Regional Director Ismael Aya-ay (2nd from L) and Sta. Margarita Mayor Gemma Zosa (2nd from R) cut the ceremonial ribbon during the inauguration of the 3.1-kilometer Ilo-Balud farm-to-market road implemented under the second phase of the Agrarian Reform Communities Project (ARCP-II). STA. MARGARITA, Samar – A 3.1-kilometer road constructed here as an alternate route for farmers in an upland area was turned over last week by the Department of Agrarian Reform (DAR). Instead of passing by the national highway, farmers can already pass through the mountain in going to Barangay Ilo from Barangay Balud or vice-versa. The area is also accessible now to all types of vehicles. DAR Assistant Regional Director Ismael Aya-ay who led the turnover and inauguration rites disclosed that the P18.4-million project was supposedly a road opening and spot concreting only. However, thru the efforts of the local government unit (LGU) under the administration of Mayor Gemma Zosa, the farm-to-market road project traversing from Barangay Ilo to Barangay Balud passing thru the mountain area is almost completely concreted. The cost of the project implemented under the second phase of the Agrarian Reform Communities Project (ARCP-II) was shared by the national government thru a loan from the Asian Development Bank (ADB), and the LGU of Sta. Margarita. Under the agreement between the ARCP-II and the said LGU, the recipients should allocate funds for the maintenance of the project within 10 years. Otherwise, the recipients will be shouldering the loan portion of the national government turning grant into a liability. But in this case where the LGU had already improved the road by concreting throughout, according to Samar Provincial Agrarian Reform Program Officer-I Segundino Pagliawan, the recipient villages will no longer find it hard in the maintenance of it. 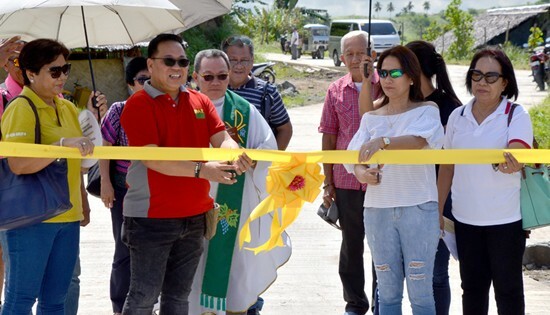 Meanwhile, Mayor Zosa expressed her gratitude to the DAR for opening this road which led to the LGU’s construction of road networks that would link villages in her municipality as well as to the villages of the adjacent town of Gandara. Zosa added that this also opened opportunities for the farmers, thus she encouraged them to produce more and have higher income. Further, she encouraged the farmers to produce more of the “kalinayan rice” or the “red rice” which according to her, a well-known department store in Metro Manila is willing to tie-up with their municipality in the marketing of this product. More than 1,600 residents in this area, wherein 180 are agrarian reform beneficiaries, are expected to be benefited by the project implemented under the Program Beneficiaries Development component of the Comprehensive Agrarian Reform Program (CARP). DTI Secretary Ramon M. Lopez encourages the attendees of the Marawi Entrepreneurship and Job Fair to take advantage of the microfinancing programs of the government and private sectors. MARAWI CITY – The Department of Trade and Industry (DTI) offered microfinance solutions amounting to P100M to Internally Displaced People (IDPs) during the Marawi Entrepreneurship and Job Fair held last July 16 at the Mindanao State University main campus in Marawi City. DTI invited Marawi entrepreneurs to take advantage of the Pondo sa Pagbabago at Pag-asenso Program (P3), a microfinance program for micro-entrepreneurs with loans as low as P5,000. P3 was established by President Rodrigo Roa Duterte to combat the prevalence of 5-6 lenders who offer interest as high as 20% per month. Under the P3 Program, DTI allotted P50 million for IDPs and another P50 million for wounded soldiers and families of soldiers killed during the Marawi siege. Of these amounts, P5.28 million has been loaned to 364 IDPs and P11.96 million has been released to 167 soldiers and/or their families. P3 loans are released a day after applications are approved and borrowers only need to submit to their nearest Negosyo Center a certification of their business. The said certification need not be a business permit as Small Business Corporation (SBCorp), DTI’s microfinance arm, accepts certificates from market associations for market vendors. DTI and SBCorp are working on further simplifying the requirements to address these concerns as some Marawi entrepreneurs can’t provide a certification since they could only set up stalls along the main roads after the siege. “President Duterte’s vision for P3 is for it to replace 5-6 as the primary source of working capital for micro entrepreneurs. To do this, we are working to rival their wide reach and accessibility,” said DTI Secretary Ramon M. Lopez. The Marawi Entrepreneurship and Job Fair was organized by DTI in partnership with Task Force Bangon Marawi (TFBM), the Department of Social Welfare and Development (DSWD), the Department of Labor and Employment (DOLE), Radio Television Malacanang (RTVM), the Training Technical Education and Skills Development Authority (TESDA), Mindanao State University (MSU), United States Agency for International Development (USAID), Philippine Disaster Resilience Foundation (PDRF), Coca-Cola, ASA Philippines Foundation and Al-Amanah Islamic Bank. DPWH Region 8 Inspectors Ma. Luisa Pedrosa and Terencio Regala with Mech. Engr. Edward Arma, the head of the Equipment Services Unit of SFDEO. CALBAYOG CITY – DPWH Samar First District Engineering Office (SFDEO) undergoes 2nd quarter inspection of service vehicles and equipment on July 18, 2018. Inspectors from the Regional Office, Mr. Terencio L. Regala and Ms. Ma. Luisa V. Pedrosa inspect 25 service vehicles assessing their cleanliness, accessories’ functions and updated Land Transportation Office (LTO) registrations as well as the driver’s license of the operators of these vehicles. 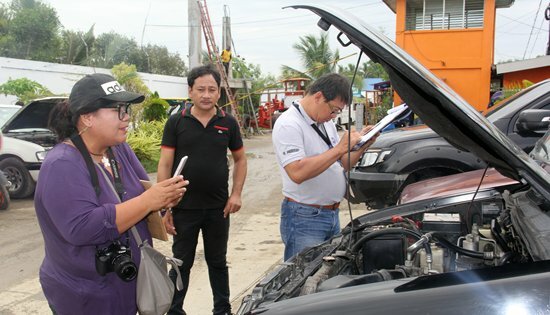 “This inspection ensures that the service vehicles used by this office are safe for the roads and that their drivers have a good understanding of their roles and responsibilities in compliance with not only DPWH standards but also to the standards of other government agencies such as the LTO and Highway Patrol Group,” said Inspector Pedrosa. On the last vehicle inspection conducted last April 24, 2018, SFDEO ranked 2nd place among the 13 District Engineering Offices in Region VIII because it satisfactorily complied with all of the standards required in the use and maintenance of its service vehicles. The final findings and assessment for this quarter will be communicated back as soon as it is evaluated in the Regional Office.